Bliss is the first opera by the Australian composer Brett Dean. Its inspiration was the first novel by Peter Carey, the Australian novelist and twice Booker prize winner. 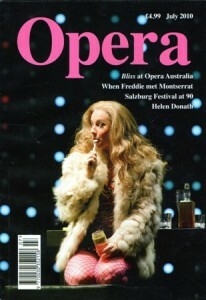 The work was commissioned by Opera Australia and its premiere took place at the Sydney Opera House on 12 March 2010. The production, by Neil Armfield, was designed by Brian Thomson with costumes by Alice Babidge, and conducted by Elgar Howarth. Peter Coleman-Wright created the role of Harry Joy, Merlyn Quaife his wife and Lorina Gore his muse, Honey B. The production – which received eleven nominations for the opera in Australia’s annual Helpmann awards – went from Sydney to Melbourne and then to the Edinburgh Festival in September. A second production, directed by Ramin Gray and conducted by Simone Young – who commissioned the opera when she was at Opera Australia – opened at the Hamburg Staatsoper on 12 September 2010. AH: I drafted the libretto in 2007 and the music was swiftly written the following year. Dean had been planning the opera for some time and had already written an orchestral suite – Moments of Bliss – examining key moments in the narrative, premiered in 2004. As Dean was also commissioned by Sir Simon Rattle to write a piece for his concert with the Royal Liverpool Philharmonic in Liverpool on 2 October 2008, he and I wrote Songs of Joy, three arias for the main protagonist – Harry Joy – for this occasion before completing the rest of the opera. remain, reminders of a past that shocked. until the day I vanish from the scene. that carries me away from my true love. a life in Hell can still aspire to BLISS.